Ixekizumab improves signs/symptoms of psoriatic arthritis (PsA). We present an integrated analysis of baseline disease burden and post-baseline outcomes in ixekizumab-treated patients with enthesitis or dactylitis. Data from SPIRIT-P1 and SPIRIT-P2 were integrated. Patients with PsA were randomized to 80-mg ixekizumab every 4 weeks (IXEQ4W) or 2 weeks (IXEQ2W), after a 160-mg starting dose, or to placebo. Inadequate responders at week 16 received rescue therapy. Among patients with baseline enthesitis (Leeds Enthesitis Index [LEI] > 0) or dactylitis (Leeds Dactylitis Index-Basic [LDI-B] > 0), baseline characteristics and disease burden were reported. 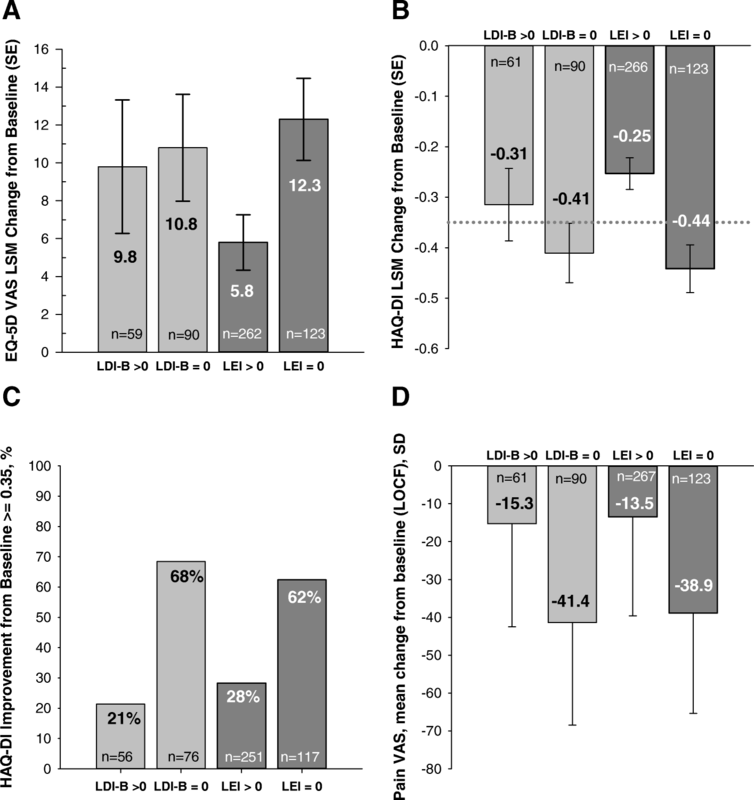 At week 24, LEI and LDI-B (percentage of patients with resolution [LEI = 0, LDI-B = 0]) were assessed. In pooled treatment groups, the impact of enthesitis or dactylitis resolution on health-related quality of life (HRQoL) (EuroQol-5 Dimensions Visual Analogue Scale [EQ-5D VAS]), physical function (Health Assessment Questionnaire-Disability Index [HAQ-DI]), and pain was assessed. The integrated analysis set comprised 679 patients; of these, 60% (n = 403 of 675) had baseline enthesitis (LEI > 0) and 23% (n = 155 of 676) had baseline dactylitis (LDI > 0). At week 24, ixekizumab-treated patients experienced significantly more resolution than placebo of enthesitis (39% IXEQ4W, 35% IXEQ2W, 21% placebo) and dactylitis (78% IXEQ4W, 65% IXEQ2W, 24% placebo). Furthermore, at entheseal points measured by the LEI, ixekizumab-treated patients had significantly higher resolution of enthesitis compared to placebo. 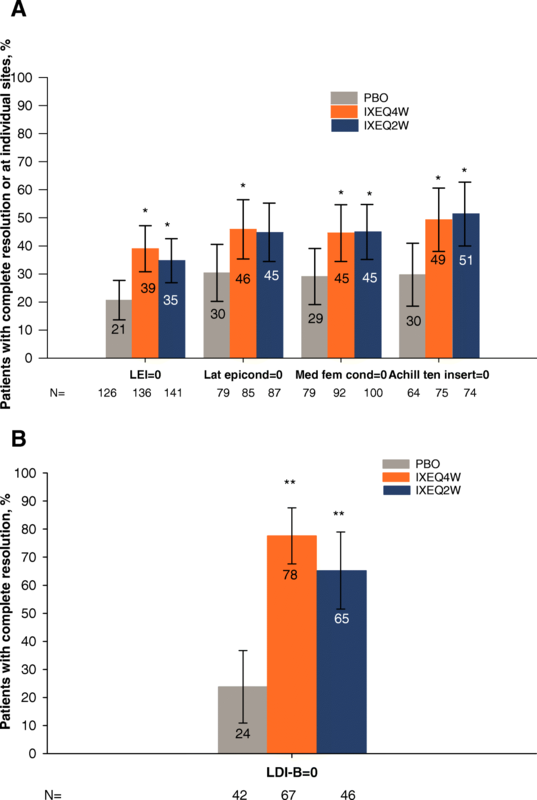 At week 24, among all placebo- and ixekizumab-treated patients, resolution of enthesitis was associated with improvements in function and HRQoL whereas dactylitis resolution was associated with more limited improvements. The least squares mean HAQ-DI improvements from baseline were − 0.44 and − 0.25 for patients who did/did not resolve enthesitis, and − 0.41 and − 0.31 for patients who did/did not resolve dactylitis. EQ-5D VAS improvements were 12.3 and 5.8 for patients who did/did not resolve enthesitis, and 10.8 and 9.8 for patients who did/did not resolve dactylitis. Among patients with pre-existing enthesitis or dactylitis, IXEQ2W- and IXEQ4W-treatment resulted in significant improvements in enthesitis and dactylitis. Enthesitis resolution was associated with improvements in patients’ function, pain, and HRQoL. ClinicalTrials.gov, NCT01695239, registered on September 25, 2012, and NCT02349295, registered on October 10, 2014. Psoriatic arthritis (PsA) is a chronic, inflammatory musculoskeletal disease that frequently affects multiple joints in the peripheral and axial skeleton, with clinical and radiological damage progressing over time [1, 2]. Clinical features of PsA include enthesitis and dactylitis , which were highlighted by the Group for Research and Assessment of Psoriasis and Psoriatic Arthritis (GRAPPA) as two of the six commonly accepted clinical domains of PsA that should be considered in treatment decisions . Enthesitis (inflammation at tendon, ligament, or joint capsule’s insertion sites into bone) may be the primary lesion in the development of PsA and was present in 24 to 83% of patients with PsA in various clinical trials using different measures [4, 5]. Similarly, dactylitis (inflammation of the whole digit) is reported to be present in 32 to 48% of patients with PsA [6, 7]; frequently, multiple digits are involved . Real-world evidence suggests that enthesitis and dactylitis are associated with higher disease burden . Biologic therapy for patients with active enthesitis and/or dactylitis is effective and is now recommended for patients who have not responded well to nonsteroidal anti-inflammatories or corticosteroid injections [3, 10]. Ixekizumab is an anti-interleukin-17A (IL-17A) antagonist that has recently been approved for the treatment of active PsA [11–14]. Here, we present a post hoc integrated analysis of SPIRIT-P1  and SPIRIT-P2  to describe the baseline disease burden of enthesitis and dactylitis and outcomes in patients with enthesitis and dactylitis. Data were obtained from SPIRIT-P1 (NCT01695239) and SPIRIT-P2 (NCT02349295) [13, 14]. These are randomized, double-blind, placebo-controlled, phase 3 trials involving patients with active PsA previously described [13, 14]. Patients were randomized to subcutaneous injections of placebo, ixekizumab 80 mg once every 2 weeks (IXEQ2W), ixekizumab 80 mg once every 4 weeks (IXEQ4W), or adalimumab 40 mg Q2W (SPIRIT-P1 only; not reported here). Both ixekizumab regimens included a 160-mg starting dose. At week 16, inadequate response (defined by blinded, predefined criteria of < 20% improvement from baseline in both tender joint counts [TJC] and 25 swollen joint counts [SJC]) was required to add or modify concomitant medications. Patients in the placebo group who were inadequate responders at week 16 were given rescue therapy (including conventional disease-modifying antirheumatic drugs [DMARDS], nonsteroidal anti-inflammatory drugs, oral corticosteroids) and were randomized to ixekizumab (IXEQ2W or IXEQ4W) and continued ixekizumab for the remainder of the study. Likewise, inadequate responders who were initially randomized to ixekizumab received rescue therapy and continued with the initial ixekizumab regimen. SPIRIT-P1 and SPIRIT-P2 have similar study designs, with some exceptions; in SPIRIT-P1, patients were biologic-naive, whereas in SPIRIT-P2, patients were experienced with conventional DMARDs and biologic DMARDs. These trials were compliant with ethical guidelines including the Declaration of Helsinki and other relevant laws and regulations. The protocols were approved by each site’s ethical review committee/institutional review board and all patients provided written informed consent. Enthesitis was assessed by the presence or absence of tenderness at the 6 sites of the Leeds Enthesitis Index (LEI), lateral epicondyle (left and right), medial femoral condyle (left and right), and Achilles tendon insertion (left and right) . The absence (score = 0) or presence (score = 1) at each of 6 sites is determined; results from the 6 sites are then added to produce an LEI total score ranging from 0 to 6. Dactylitis was assessed by the Leeds Dactylitis Index-Basic (LDI-B) [16, 17]. Scores based on the circumference and tenderness (presence or absence) of affected digits were calculated and only acute (tender) dactylitis was counted. The results of each digit are then added to produce a total score. Physical function and health-related quality of life (HRQoL) were assessed by the Health Assessment Questionnaire Disability Index (HAQ-DI) [18, 19] and 5-level EuroQol-5 Dimensions (EQ-5D 5L) instrument, respectively . Patient global assessment (PtGA)  and pain visual analogue scale (VAS) were used to assess disease activity and pain intensity, respectively . The HAQ-DI is scored on a scale of 0 (no functional impairment) to 3 (complete impairment) ; the minimal clinically important difference (MCID) is estimated to be an improvement from baseline of 0.35 . The PtGA and pain VAS are scored on a scale of 0–100 mm, in which higher scores represent more disease activity or pain intensity, respectively [21, 22]. The EQ-5D comprises a VAS (0–100 scale in which 0 = worst health you can imagine and 100 = best health you can imagine) as well as the EQ-5D descriptive system, which includes 5 dimensions (mobility, self-care, usual activities, pain/discomfort, anxiety/depression) measured in 5 levels ranging from 1 = no problems to 5 = extreme problems. Responses to the EQ-5D dimensions can be used to obtain a single index value, with a range from 1 = full health to 0 = dead . The presence of enthesitis and dactylitis was defined as LEI > 0 and LDI-B > 0, respectively, at baseline. Resolution of enthesitis and dactylitis was defined as LEI = 0 and LDI-B = 0, respectively. Integrated analyses of the placebo, IXEQ2W, and IXEQ4W groups were performed using data from both SPIRIT-P1 and SPIRIT-P2 trials. An integrated analysis of adalimumab could not be performed because only SPIRIT-P1 had an adalimumab group. Missing data (and data from inadequate responders from week 16 to week 24) were considered as nonresponse for categorical measures (nonresponder imputation [NRI]) or imputed with last observation carried forward (LOCF) method for continuous measures. Comparisons between placebo and ixekizumab treatment groups were performed with a logistic regression model using Wald’s test with treatment and study as factors. In post hoc analyses, associations between HAQ-DI or EQ-5D and enthesitis or dactylitis were based on an analysis of covariance model, adjusting for Disease Activity in PSoriatic Arthritis (DAPSA) change from baseline (LOCF), study, and LDI-B = 0 or LEI = 0 in the model. DAPSA is comprised of SJC + TJC + PtGA + patient pain + C-reactive protein [mg/dL]) [25, 26]. Change from baseline (LOCF) in pain was summarized using mean and standard deviation by patients’ enthesitis/dactylitis resolution status at week 24. The integrated analysis set comprised 679 patients. At baseline, 60% (n = 403 of 675) had enthesitis (LEI > 0) and 23% (n = 155 of 676) had dactylitis (LDI-B > 0). Tables 1 and 2 show the baseline characteristics of patients with enthesitis or dactylitis and of all patients within the integrated analysis set. Among patients with baseline enthesitis, the mean (SD) baseline TJC was slightly higher (25.2 ± 15.5) compared to the overall population (22.0 ± 14.9), whereas the baseline SJC was similar to the overall population (12.5 ± 9.1 and 11.9 ± 9.1, respectively). Among patients with baseline dactylitis, baseline TJC was similar to the overall population (22.2 ± 13.5 and 22.0 ± 14.9, respectively) whereas baseline SJC scores were higher than the overall population (15.2 ± 11.3 and 11.9 ± 9.1, respectively); the percentage of patients with a baseline body surface area of psoriasis ≥ 3% was higher than the overall population (74% [n = 105 of 141] and 65% [n = 402 of 615], respectively) (Table 1). Among patients with either enthesitis or dactylitis, the mean baseline HAQ-DI score was 1.3, which was similar to the burden in the overall population (Table 2). Among patients with enthesitis (n = 389) or dactylitis (n = 151) and non-missing data at baseline, approximately 80% reported moderate, severe, or extreme scores for the pain/discomfort domains of the EQ-5D 5L. Likewise, approximately 45 to 51% of patients reported moderate, severe, or extreme scores for the mobility and usual activities domains. (Additional file 1). Significantly higher proportions of IXEQ4W (39%)- and IXEQ2W (35%)-treated patients with enthesitis at baseline experienced resolution of enthesitis at week 24 than placebo (21%) (Fig. 1a) in the integrated data set. While results for the adalimumab arm in SPIRIT-P1 were not included in the integrated analyses, 19% (placebo), 33% (adalimumab, P = 0.073), 43% (IXEQ4W, P = 0.005), and 39% (IXEQ2W, P = 0.025) of patients with baseline enthesitis experienced resolution of enthesitis at week 24  in that trial. Likewise, in the integrated dataset, for the lateral epicondyles, medial femoral condyles, and Achilles tendon insertion sites, significantly higher proportions of IXEQ4W-treated patients experienced complete resolution of enthesitis than placebo-treated patients (Fig. 1a). Additional file 2 shows enthesitis resolution of the individual sites of all treatment groups, including adalimumab in SPIRIT-P1. Significantly higher proportions of IXEQ4W (78%)- and IXEQ2W (65%)-treated patients with dactylitis at baseline experienced resolution of dactylitis at week 24 than placebo (24%) (Fig. 1b). While results for the adalimumab arm in SPIRIT-P1 were not included in the integrated analyses, 25% (placebo), 78% (adalimumab, P = 0.001), 80% (IXEQ4W, P < 0.001), and 77% (IXEQ2W, P < 0.001) of patients with baseline dactylitis experienced resolution of dactylitis at week 24 in that trial . Among patients who did not have dactylitis (LDI = 0) or enthesitis (LEI = 0) at baseline, numerically more placebo patients had a post-baseline LEI > 0 or LDI > 0 than those patients receiving ixekizumab. Among 514 patients with LDI = 0 at baseline, 8/108 (7.4%) patients on placebo had an LDI > 0 at week 24 vs 1/124 (0.8%) on IXEQ4W and 2/142 (1.4%) on IXEQ2W. In the placebo group, 80/180 (44.4%) patients had LDI > 0 at any time post-baseline vs 34/157 (21.7%) on IXEQ4W or 37/177 (20.9%) on IXEQ2W. Among 271 patients with LEI = 0 at baseline, 11/58 (19.0%) on placebo had LEI > 0 at week 24 vs 6/76 (7.9%) on IXEQ4W or 6/69 (8.7%) on IXEQ2W. In the placebo group, 50/97 (51.5%) had an LEI > 0 at any time post-baseline vs 23/93 (24.7%) on IXEQ4W or 18/81 (22.2%) on IXEQ2W. At week 24, resolution of enthesitis symptoms was associated with improvements in patients’ HRQoL (EQ-5D) and function (HAQ-DI), with a larger proportion of patients meeting the MCID for HAQ-DI change from baseline than patients without resolution (Fig. 2a–c). In addition, patients who resolved enthesitis had less pain at week 24 than patients without resolution (Fig. 2d). At week 24, resolution of dactylitis symptoms was associated with a greater proportion of patients meeting MCID in HAQ-DI change from baseline than without resolution, but smaller numerical improvements in patient function and HRQoL than patients resolving/not resolving enthesitis (Fig. 2a–c). Resolution of dactylitis was associated with improvements in patient-reported pain at week 24 (Fig. 2d). PsA is a heterogeneous disease, with enthesitis and dactylitis as manifestations for many patients. In this cohort, 60% of patients had enthesitis and 23% of patients had dactylitis at baseline, consistent with published estimates of 24 to 83% for enthesitis, but somewhat lower than published estimates of 32 to 48% for dactylitis [5–7]. In this integrated analysis of SPIRIT-P1 and SPIRIT-P2, ixekizumab-treated patients with enthesitis or dactylitis at baseline experienced greater resolution in their enthesitis or dactylitis compared to placebo at week 24. We further found that resolution of these manifestations were associated with improvements in function and HRQoL, irrespective of treatment. Patients who had resolution of their enthesitis/dactylitis symptoms also experienced less pain. In patients with enthesitis and dactylitis, patient-reported pain and PtGA at baseline were slightly higher than the overall population, whereas HAQ-DI and EQ-5D 5L and VAS were similar to the overall population. Our analyses did not compare baseline disease burden between patients with vs without enthesitis or with vs without dactylitis; however, recent real-world evidence has shown a greater disease burden in patients with, relative to patients without, enthesitis [9, 27, 28]. Using data from the University of Toronto PsA cohort , Polachek et al. demonstrated that patients with enthesitis, as measured by the Spondyloarthritis Research Consortium of Canada (SPARCC) enthesitis index, compared to patients without enthesitis had a higher actively inflamed joint count (odds ratio [OR] 1.06, P = 0.0002), presence of dactylitis (OR 2.5, P = 0.02), presence of tenosynovitis (OR 5.3, P < 0.0001), and more pain (OR 1.15, P = 0.01). Similarly, in a retrospective, cross-sectional study from the Consortium of Rheumatology Researchers of North America PsA/Spondyloarthritis Registry , patients with enthesitis, as measured by the SPARCC, had higher overall work/activity impairment, patient-reported pain, and fatigue compared with patients without enthesitis; however, patients with dactylitis, compared to those without dactylitis, were less impacted based on overall work/activity impairment, pain, and fatigue relative to patients with enthesitis. Differences between real-world evidence and the data presented here may reflect differences in populations enrolled in clinical trials compared to those in the real world. We did observe that patients whose enthesitis resolved had twice the improvement in quality of life (EQ-5D) compared to patients with residual enthesitis. Pain also improved by more than 2-fold compared to patients who had residual enthesitis symptoms. Greater improvement in functional ability (HAQ-DI) was also seen in patients with resolution of enthesitis vs those with residual entheseal symptoms, and notably more than double the percentage of patients with resolution of enthesitis reported clinically meaningful changes in HAQ-DI compared to patients with unresolved enthesitis. Resolution of dactylitis was associated with smaller improvements relative to enthesitis resolution based on mean change from baseline of HAQ-DI and EQ-5D scores. Similar to the enthesitis analysis, a higher percentage of patients with dactylitis resolution reported clinically meaningful changes in HAQ-DI compared to patients with unresolved dactylitis and percentages of patients with/without dactylitis were similar to those of patients with/without enthesitis; there were also improvements in pain. The ability to see an association of improvement in physical functioning and quality of life with dactylitis resolution may be limited due to the smaller numbers of patients with dactylitis than enthesitis. Additionally, the model adjusted for DAPSA, which includes a measure of TJC and SJC; the adjustment for joint activity may have confounded analysis of association between dactylitis and functioning/quality of life. The association between dactylitis and HRQoL is inconsistent in literature [9, 28]. Anecdotally, based on personal patient observations made by the authors, patients with dactylitis may not be as symptomatic as patients with enthesitis. Pain was only summarized (i.e., without adjustment for DAPSA) because pain is a component of DAPSA. Despite the challenges in assessment of enthesitis, we did observe significant treatment effects with ixekizumab for the LEI total score as well as at the individual sites comprising the index (lateral epicondyle, medial femoral condyle, Achilles tendon insertion). Several factors can increase the inter-observer variability of the assessment of enthesitis, such as the identification of the entheseal points, the intensity of the pressure applied, the patient’s pain threshold level, or the presence of other conditions that also cause pain (e.g., fibromyalgia) [5, 29]. Of note, numerically, the largest differences between ixekizumab and placebo in the resolution of enthesitis were observed at the Achilles tendon insertion. This site may be the most reliable site for detecting treatment effects in clinical trials due to the lack of overlap with the tender points of fibromyalgia , which can confound its assessment. Additionally, it should be noted that the LEI limits detection to 6 sites, whereas other enthesitis indices measure more sites. While these results indicate that ixekizumab is effective for the treatment of enthesitis and dactylitis, the SPIRIT studies were not designed to evaluate enthesitis and dactylitis as primary endpoints. Additionally, patients in SPIRIT-P1 and SPIRIT-P2 were not randomized based on enthesitis or dactylitis, enthesitis or dactylitis were not required at entry, nor was a specific symptom threshold specified; inadequate responders were defined based on tender and swollen joint counts. As expected, some patients on placebo who received background medications experienced resolution of dactylitis or enthesitis consistent with published data . Future studies of enthesitis could utilize imaging techniques that can measure pathology such as ultrasound and whole body MRI, which are being investigated [5, 29, 31]. The Outcome Measures in Rheumatology Ultrasound Task Force recently attempted to define enthesitis using ultrasound and included hypoechogenicity, increased thickness of the tendon insertion, calcifications, enthesophytes, erosions, and Doppler activity as core lesions of ultrasound-detected enthesitis, but this work is not fully validated . GRAPPA is also attempting to develop an imaging index for enthesitis [33, 34]. Treatment with ixekizumab every 2 weeks and every 4 weeks resulted in significant improvements in enthesitis and dactylitis in patients with pre-existing enthesitis or dactylitis. Resolution of enthesitis symptoms was associated with improvements in patients’ function, pain, and HRQoL, irrespective of treatment. We are indebted to the patients and study personnel who participated in SPIRIT-P1 and SPIRIT-P2. We thank Lori Kornberg, PhD and Noelle Gasco, BA of Syneos Health (Raleigh, NC, USA), who provided writing and editorial support, respectively, on behalf of Eli Lilly and Company. We also acknowledge Justin Grondines, BS (ClinBAY, Belgium), and Pascal Sornom, PhD (ClinBAY, France), for assistance with statistical programming. The work described in this manuscript was designed by the funder, Eli Lilly and Company, with input from the academic authors. The data were analyzed and interpreted by Eli Lilly and Company in collaboration with the academic authors. All authors had final responsibility for the decision to submit for publication. Lilly provides access to relevant anonymized patient level data from studies on approved medicines and indications as defined by the sponsor specific information on clinicalstudydatarequest.com. For details on submitting a request see the instructions provided at clinicalstudydatarequest.com. All authors were involved with data analysis and/or interpretation. In addition, DDG participated in conception, design, and data acquisition. AMO, GG, SR, and JB were also involved in the design of the work. SR, GG, and DS were also involved in the conception of the work. AMO, UK, and HMO were also involved in the data acquisition. All authors participated in the writing and/or critical revision of the manuscript and approved the final version for submission. SPIRIT-P1 and SPIRIT-P2 were conducted in accordance with Good Clinical Practice, the principles of the Declaration of Helsinki, and local laws and regulations. Both SPIRIT-P1 and SPIRIT-P2 were registered at ClinicalTrials.gov. SPIRIT-P1 was registered as NCT01695239 on 25-September-2012 (https://clinicaltrials.gov/ct2/show/NCT01695239); SPIRIT-P2 was registered as NCT02349295 on 10-October-2014 (https://clinicaltrials.gov/ct2/show/NCT02349295). SPIRIT-P1 was approved by the Western Institutional Review Board (approval #1-838258-1) and SPIRIT-P2 was approved by the Bellberry Human Research Ethics Committee (Application #2015-01-049-AA). For both studies, approval was also obtained from each additional site. All patients in both studies gave written informed consent. D. D. Gladman is a consultant for AbbVie, Amgen, BMS, Celgene, Eli Lilly and Company, Janssen, Novartis, Pfizer, and UCB, and has received grant/research support from AbbVie, Amgen, Celgene, Eli Lilly and Company, Janssen, Novartis, Pfizer, and UCB. A.-M. Orbai is a consultant for Eli Lilly and Company, Novartis, and has received grant/research support from AbbVie, Celgene, Eli Lilly and Company, Horizon, Janssen, and Novartis. U. Kiltz has received grant and research support and consultancy fees from AbbVie, Biogen, Chugai, Grünenthal, Janssen, MSD, Novartis, Pfizer, Roche, and UCB. J.C.-C. Wei has been consulted for Pfizer, Celgene, Chugai, UCB, and TSH (Taiwan); has received research grants from BMS, Janssen, Pfizer, Sanofi-Aventis, and Novartis; and has served on speakers bureaus for Abbott, BMS, Chugai, Eisai, Janssen, and Pfizer. H. Marzo-Ortega has received grant/research support from Janssen and is on the speaker bureau for AbbVie, Celgene, Janssen, MSD, Novartis, Pfizer, and UCB. G. Gallo, J. Birt, S. Rathmann, and D. Shrom are current employees and minor shareholders of Eli Lilly and Company. Kaeley GS, Eder L, Aydin SZ, Gutierrez M, Bakewell C. Enthesitis: a hallmark of psoriatic arthritis. Semin Arthritis Rheum. 2018. doi: https://doi.org/10.1016/j.semarthrit.2017.12.008 [Epub ahead of print]. Eli Lilly and Company. TALTZ-ixekizumab injection, solution [Prescribing Information]. 2018. http://uspl.lilly.com/taltz/taltz.html#pi. Accessed 12 July 2018. Taltz: EPAR - Product Information. Annex I - summary of product characteristics. 2018. http://www.ema.europa.eu/docs/en_GB/document_library/EPAR_-_Product_Information/human/003943/WC500205804.pdf. Accessed 4 Apr 2018. EQ-5D web site. http://www.euroqol.org/. Accessed 18 Jan 2017. Wervers K, Luime JJ, Tchetverikov I, Gerards AH, Kok MR, Appels CWY, et al. Quality of life at baseline in early psoriatic arthritis related to disease domains [abstract 1706]. Arthritis Rheumatol. 2016; 68 (Suppl 10). https://acrabstracts.org/abstract/quality-of-life-at-baseline-in-early-psoriatic-arthritis-related-to-disease-domains/. Accessed 17 Mar 2017. Tom S, Zhong Y, Cook R, Aydin SZ, Kaeley G, Eder L. Development of a preliminary ultrasonographic enthesitis score in psoriatic arthritis - GRAPPA Ultrasound Working Group. J Rheumatol. 2018. https://doi.org/10.3899/jrheum.171465 [Epub ahead of print].